by Zac F. Walls, Ph.D.
2018 saw the first in vivo gene editing drugs enter clinical trials. While a number of drugs can modulate the expression or activity of gene products at the RNA and protein levels, gene editing drugs act on the genome itself. Specifically, these drugs can add, delete, or replace specific segments of DNA, thereby offering the potential for permanent therapeutic effects. There are a number of advantages that in vivo gene editing approaches have over existing therapies. For example, traditional gene therapies typically drive the expression of a therapeutic gene outside of its normal genomic context. Gene editing, on the other hand, has the capacity to preserve the natural regulation of the therapeutic gene. And unlike the ex vivo gene editing used in CAR T therapy, in vivo gene editing does not require the removal of a patient’s cells, simplifying the process of drug sterilization and manufacturing. 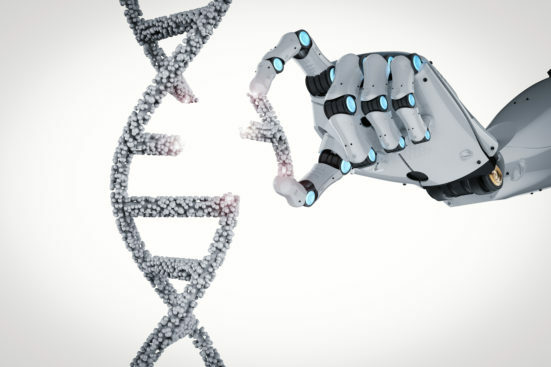 This post summarizes three platforms being used to make the first generation of in vivo gene editing drugs and touches on the potential that this technology holds for the future of medicine. Zinc finger nucleases (ZFNs) are fusion proteins consisting of a zinc finger array linked to an endonuclease. First described in 19961, ZFNs have the longest history of the three main gene editing platforms. Zinc fingers, originally discovered in 1985 as a novel class of eukaryotic transcription factors2,3, are zinc-containing proteins that bind to specific sequences of DNA. It wasn’t until 1994, however, that researchers deliberately engineered an artificial zinc finger that could bind to a 9-bp region of the genome with high specificity4. These groundbreaking experiments demonstrated that the human genome could be systematically targeted through rational protein design, opening the door to a host of therapeutic possibilities. The most impactful application of engineered zinc finger proteins is arguably their fusion to endonucleases to achieve site-specific double stranded DNA breaks. In the presence of DNA with sufficient sequence similarity, a double stranded break can be repaired in human cells through the process of homologous recombination. Biomedical scientists have leveraged this knowledge for decades to alter genetic sequences in eukaryotic genomes, but the clinical translation of this methodology has been historically hindered by a lack of efficiency and specificity. However, the invention of ZFNs forever altered the trajectory of genetic medicine, and the efforts to develop them into drugs has been ongoing for nearly 20 years. Current efforts include developing ZFN drugs to treat inherited diseases such as hemophilia and mucopolysaccharidosis. Transcription activator-like effector (TALE) proteins are secreted by bacteria that infect crops like rice, peppers, and tomatoes, and make the plants more susceptible to infection. Although identified approximately three decades ago5,6, it wasn’t until more recently that researchers found that TALEs bind to specific regions of their plant host genomes and then regulate the expression of nearby genes to facilitate infection7,8,9,10. Much like zinc fingers, TALEs were adapted for genome editing by fusing them to endonucleases. The resulting TALENs, however, have encountered specific challenges on their path towards pharmaceutical development. Despite reports of higher efficiencies in causing double strand breaks compared to ZFNs, TALENs are three times larger. This size disparity makes it difficult to package TALENs into viral vectors. TALENs have seen use in ex vivo gene editing to generate off-the-shelf CAR T therapies (for more information on CAR T cell therapies, please see our posts on CAR T design, production, and toxicity and on hurdles to CAR T development and approval). Since these applications do not have as many restrictions on vector usage, TALENs may prove advantageous in those settings. The newest of the gene editing group, but arguably the most publicized, is CRISPR. CRISPR was originally described as a rudimentary immune system used by bacteria as a defense against bacteriophages (i.e., viruses that infect bacteria). The CRISPR system utilizes a short guide RNA, which can base pair with specific DNA sequences in the genome. The guide RNA also includes a region that acts as a scaffold for the binding of an endonuclease known as Cas9. Cas9 causes double stranded DNA breaks if and only if it is bound to the guide RNA. When paired with exogenous DNA sequences, CRISPR can be used to insert or replace genomic sequences in a site-specific manner via homologous recombination, just like ZFNs and TALENs. Compared to ZFNs and TALENs, however, the protein component of CRISPR does not vary. Because nucleic acid synthesis is much more tractable than protein engineering and production, CRISPR was recognized almost immediately as a cheaper and faster technology for gene editing than the other two technologies11,12,13,14. Since 2012, CRISPR has been thrust headlong into the drug development spotlight. It has quickly become one of the most impactful discoveries in biomedical science. Like the TALEN field, however, CRISPR researchers have struggled to find appropriate vectors for in vivo applications. Due to the necessity of delivering two different types of biomolecules, alternatives to viral vectors such as ribonucleoproteins or lipid nanoparticles may prove to be the most suitable vehicles for in vivo CRISPR therapeutics. Researchers are already pursuing ex vivo applications of CRISPR for hematological and immunooncological indications. For example, CRISPR is currently being investigated for the treatment of the blood disorders β-thalassemia and sickle cell anemia. Many questions remain regarding the safety, efficacy, and ethics of in vivo gene editing. Despite the theoretical specificity of these technologies, off-target double strand DNA breaks have been observed in preclinical models15. Furthermore, no consensus exists for the best way to measure the specificity of these drugs. The NIH recently launched the Somatic Cell Genome Editing program, which will, in part, support the development of preclinical testing platforms necessary to fulfill key regulatory gaps in the development of gene editing drugs. These will be crucial to advancing these therapeutics, as they will enable cell-specific safety and efficacy testing that goes beyond DNA sequencing. As alluded to above, the delivery of these complex therapies has also been an issue in their advancement to the clinic. Viral vectors will be used for the first wave of clinical trials, but viruses have many shortcomings that may limit their utility for these drugs. It also remains to be seen how immunogenic the protein components of these platforms will be in humans. Despite these lingering questions, the entrance of gene editing into the clinic marks a sea change in modern medicine. These tools have started to fulfill the promises made by the Human Genome Project almost 30 years ago. In particular, they presage a time in the not too distant future when health care will focus on curing diseases rather than treating symptoms. With gene editing only recently emerging into clinical development, both drug developers and regulatory authorities are still assessing the best strategies to move these promising therapies forward. Nuventra’s consultants have many years of experience helping our clients take novel therapeutics from early stage development through marketing approval. Contact us today to find out how Nuventra can help get your gene editing product to market.